The early 20th century saw a number of significant scientific developments, and precipitated the need for more efficient methods for calculation and data analysis. The history of computing at ISU reflects this trend. In the 1920's, Henry A. Wallace and George Snedecor began teaching a seminar to faculty on rapid machine calculation of correlation coefficients, partial correlation, and the calculation of regression lines, publishing Correlation and Machine Calculation in 1925. Snedecor organized the Statistical Laboratory in the early 1930's, to promote statistical data analysis and consulting. In the fall of 1930, John Atanasoff came to Iowa State as an Assistant Professor of Mathematics and Physics, working with complex scientific calculations and equations that were time consuming and difficult to solve. Atanasoff engaged in an effort to solve the problem of complex equations with digital computing, a new investigation occurring at numerous spots around the globe at that time. Atanasoff, with his PhD student Clifford Berry, was first to build an electronic digital computer, the ABC, completed at ISU in 1939. In the early years of America's involvement in World War II, Atanasoff left ISU to work with the Naval Ordnance Laboratory in Washington D.C. While the ABC was never patented, Atanasoff was given credit in 1972 as the inventor of the first electronic digital computer in the federal court case Honeywell vs. Sperry Rand. During the 1940's, then PhD student and future founding Chair of the CS Department, Robert Stewart, dismantled the ABC in the basement of the Physics Building in order to make room for new research projects. 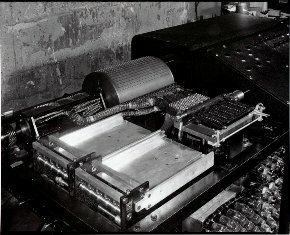 Additional special purpose computing machines were developed. 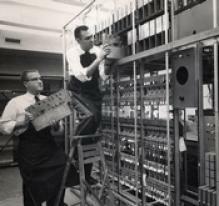 In the 1950's, faculty began to understand the changing requirements for modern scientific research, and recognized need for general purpose computing machines. Work commenced on the Cyclone Computer, a high-speed, general purpose digital computer based on the Illiac machine at the University of Illinois. Construction began during the summer of 1956 under the direction of Dr. Robert Stewart, who at the time was an Associate Professor of Physics and Electrical Engineering. As construction of the computer progressed, it was decided in 1957 that an extension to the south wing of Coover Hall was needed in order to house the finished computer. 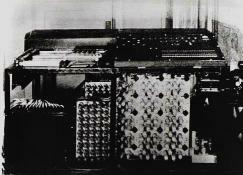 The Cyclone Computer was 10 feet tall, 12 feet long, 3 feet wide, and contained over 2,700 vacuum tubes. The computer was regularly modified and improved until it was retired and replaced in 1966 with a newer model. The Cyclone Computer inspired many theses and dissertations on computing in the 1960's. Graduate education in computer science as a discipline was formalized in 1964 by Clair Maple, Professor of Mathematics and Director of the ISU Computation Center. The undergraduate program in computer science was established in 1967 with 75 students enrolled in 17 courses. 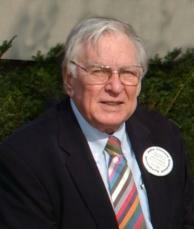 The ISU Computer Science Department was officially established in 1969, with Robert Stewart serving as the founding Department Chair. Faculty were composed of joint appointments with Mathematics, Statistics, and Electrical Engineering. In 1969, the building which now houses the computer science department, then simply called the Computer Science Building, was completed. It was later named Atanasoff Hall. Throughout the following years, the department has continued to expand and develop its teaching and research agendas. We currently have more than 30 tenured or tenure-track faculty, several lecturers, and our student enrollment includes around 600 undergraduate students, and 200 M.S. and Ph.D. students.